The easiest way to get to your destination in an airship is this steampunk globe hooked up to a tablet PC running Google Earth. Steampunk inventor John Knight is developing the perfect way to travel the globe like it was 1889. 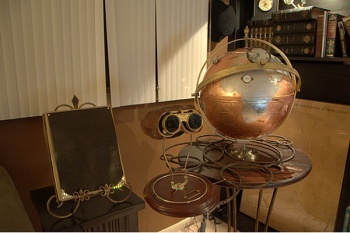 The "Electromagnetic Geospacial Globe and Remote View with Obligatory Goggles" is a set of steampunk objects that allow users to control Google Earth through the rotation of a globe. Knight steampunked a globe, a tablet PC, and a set of goggles for this project. The brass globe is hooked up to the tablet PC and controls Google Earth through RFID tags. Move the globe's rotating glass lens over a specific tag, say for "North America," and it'll rotate Google Earth to the same position. The obligatory goggles unfortunately don't do anything yet, but Knight is working on it. This would be a neat invention if it wasn't designed in a steampunk style, so the fact that it is makes it downright amazing. Steampunk objects are great, but functioning steampunk objects are much cooler, especially when they can drive an airship. Closeup images are available on Knight's flickr.